In an attempt to rethink how intermediate Latin classes are taught, during fall semester, 2012, the author incorporated a Reacting to the Past game called Beware the Ides of March: Rome in 44 B.C.E. by Carl A. Anderson and T. Keith Dix into class and required students to compose formal speeches in Latin as part of the game. To measure the effectiveness of using the pedagogy, the author conducted a qualitative study based on students' anonymous responses to two questionnaires. 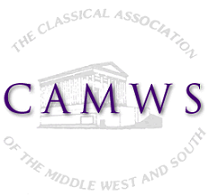 Results of the study showed that the game was most students' favorite activity of the semester, that students learned a significant amount about Roman history, that students learned more about Roman authors in general and became more engaged with Latin texts, that the composition exercises were effective for improving Latin skills, and that an overwhelming majority of students felt that their Latin skills improved during the semester despite the time spent playing the game. To meet the demand from my Latin and mythology students for an introduction to Ancient Greek, I offered a course meeting one hour per week. When 43 students enrolled, I decided to try a new pedagogy that has been increasingly popular in medical schools and business schools, Team-Based Learning (TBL). Despite the high enrollment and low number of contact hours, the results were very positive. Students retained information at a high level and were extremely enthusiastic, generating interest in the study of Greek on my campus. Students were more active in their learning and I was able to administer more challenging tests than I had done in standard introductory language classes. This is consistent with second language acquisition research on collaborative and cooperative learning. However, TBL differs from these established methods of group learning in several important ways. As a result of the success of this class, I have been able to add Greek 101 and 102 to our curriculum and have included aspects of TBL in my Latin classes. In recent years, computer supported learning has gained ground in a whole range of courses. The study of classical literature (ancient Greek and Latin), a course that has been taught for centuries around the world, is not an exception. This paper reports on a theoretical and practical approach to the computer-assisted study of Classics in higher education. We make reference to the main theoretical guidelines and some influential digital media and resources used in this direction, and we also present the conditions and results of a study that took place in order to test the approach under analysis in the field.